Come and learn the proper techniques involved with snorkeling in the comfort and safety of our heated indoor pool! Have you always wanted to try Scuba Diving? Discover Scuba is safe, easy and the most fun you have had in the water since your childhood years. Are your kids or grandkids ready to take the "plunge?" These Open Water Scuba Diver courses are for Kids Only, taught at a pace which is conducive to their learning style. The final component of your training, the Open Water Certification Dives, provides the real world experience of what you have learned in your Academic and Confined Water training. This is your opportunity to show yourself and your instructor your competency as a diver. In your Open Water class, you learned to be safe underwater. 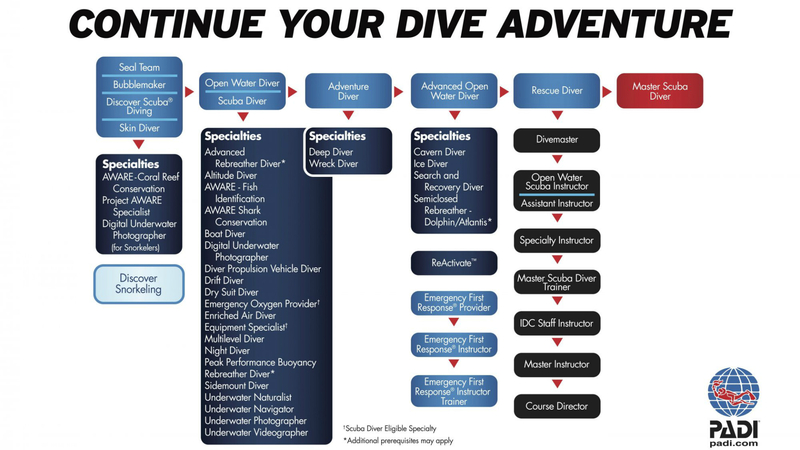 Dive into Level 2 and gain the confidence needed to explore and enjoy your new underwater world! Certified divers are often competent, but rarely confident in their skills. That is the purpose of the Advanced Open Water Diver Course. Scuba divers describe the Rescue Diver course as the most challenging yet rewarding course they've ever taken. Why? Because you learn to prevent and manage problems in the water and become more confident in your skills as a diver. The most popular specialty scuba course, Enriched Air Nitrox extends your bottom time, especially on repetitive dives. If staying down longer appeals to you, Nitrox is your course! Do you wish you knew what to do when your regulator starts free-flowing? Do you want to be the most popular person on a dive trip as you know how to save the day when someone's gear is malfunctioning? Then this is the course for you! Do you know how to help in an emergency? This basic First Aid and CPR class should be a must-do for everyone! Have you been previously certified in Emergency First Response but more than two years has passes? Then this is the class for you! Looking to do a pool workout before your next trip but only have evenings available? Then this is the answer for you!